Do you know what grabatology is? I sure didn't until I saw it on the Root Bizzle website. Even then I wasn't certain if it was a proper word, but I've come to understand that grabatology is the collecting of ties. In other words, a person collecting ties is a grabatologist. Root Bizzle also introduced me to a concept I was unaware of, a tie club or a tie subscription service. What Root Bizzle offers its customers is an easy and convenient way to expand their tie collections. If you sign up for a subscription you will receive a new tie every month for as long as the subscription lasts. If you like surprises? Or maybe you just don't want to go looking for new ties? Then this may be just what you're after. I usually buy my own ties, but I kind of like the idea of getting a new one in the mail once a month. This could also be a nice gift. Why not give a 6 or 12 months subscription to the man who has everything. One can never have too many ties. You can choose between three different types of ties: business ties, skinny ties and whimsical ties. They are all made from 100% silk and are either woven or digitally printed. 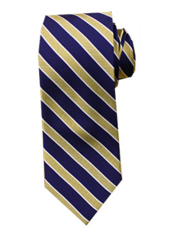 Below are some examples of ties you could get from Root Bizzle (the photos are from the Root Bizzle website). Take a look at their website and see if this could be something for you.